Written By: Ian K. Smith, M.D. Narrated By: Ian K. Smith, M.D. Dr. Ian Smith's diets really work. America has lost millions of pounds following his bestselling programs: The Fat Smash Diet, Extreme Fat Smash and, his newest, The 4 Day Diet-an eating plan that allows readers to avoid the normal (and fatal) pitfalls of dieting. 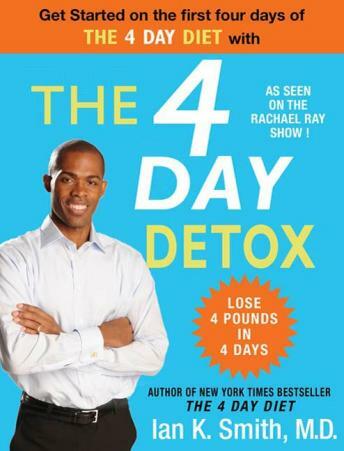 Now you can try THE 4 DAY DETOX: the first of seven four-day modules straight from The 4 Day Diet by Dr. Ian. As seen on 'The Rachael Ray Show' and 'Celebrity Fit Club', THE 4 DAY DETOX will charge up your system and remove some of the toxins your body may have accumulated and that keep you in an unhealthy eating rut. In his detox, Dr. Ian provides specific marching orders for invigorating, extremely healthy foods that not only mop up the toxins floating around in your body but naturally increase your energy and prime you to lose excess pounds. THE 4 DAY DETOX will cleanse your body, help you lose weight fast, and focus your mind on what you can do when you commit to change.